Featuring high quality products from Industries, Rain Bird, TORO and other top flight Irrigation Manufacturers. You know that watering your yard is a time consuming chore. How many times have you forgotten to water your lawn, then over-watered it, only to end up with brown spots and muddy puddles? You can forget about tripping over unsightly sprinklers and hauling hoses around the yard. You will gain valuable leisure time with the installation of a high quality, fully automatic, Advanced Irrigation Sprinkler System. Installing an Advanced Irrigation Sprinkler System immediately adds value to your home. It also protects your gardening and landscaping investment, while saving time and water. Like many homeowners, you may be using up to 50% more water than your landscape requires. The solution isn't to use more water, but to water more precisely. A sprinkler system installed by Advanced Irrigation will give you a healthy, green lawn. The success of your sprinkler system depends largely on the contractor you chose to install it. A sprinkler system consists of sprinkler heads, pipes, electrical valves, and a controller. This equipment is applied to not only imitate nature's rainfall, but to properly control the distribution of water on various types of landscape settings. The installation includes a host of irrigation supplies, specialized installation equipment, intense manual labor, and knowledge of irrigation design, including soil type and plant requirements. This is why it is important to have the best professional contractor to design and install your system - Advanced Irrigation, Inc.
You should not purchase a sprinkler system on the basis of price alone. You cannot return an unsatisfactory system. You are in fact, stuck with it, and the cost to correct an improperly designed system can be nearly as expensive as a new system. Advanced Irrigation is a quality professional contractor, who you can rely on to install an accurately designed system for your yard, at a competitive price. 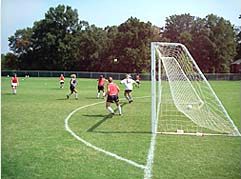 We are proud to have installed sprinkler systems for Thorndike Field in Arlington, MA (completed fall, 2001), Nolan Field in Fitchburg (fall, 2001), and Coolidge Field in Fitchburg (fall, 2002). Two of our recent commercial/civic installations are the Home Depot Plaza in Plymouth (completed fall, 2000) and the grounds of the Worcester Art Museum in Worcester (fall, 2000). Proudly serving in Massachusetts the communities of Westford, Littleton, Acton, Concord, Groton, Pepperell, Boxboro, Bolton, Harvard, Chelmsford, Billerica, Tewksbury and Dracut. In New Hampshire Hollis, Nashua, Merrimac, Milford, Bedford, Hudson, Pelham and Amherst.